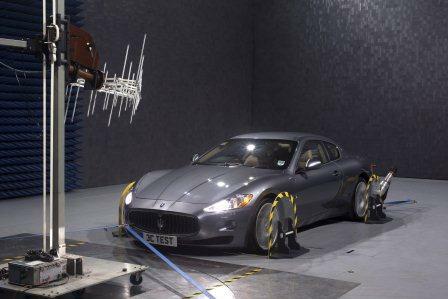 In their expansive 18m x 12m x 8m Semi-Anechoic Chamber (SAC), 3C Test have the capability of testing 4-wheel drive vehicles running under power at speeds of up to 60km/h. 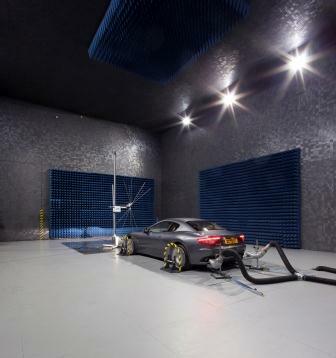 To achieve these conditions a full 4-wheel drive chassis dynamometer, designed for EMC testing, has been custom-built and installed within the chamber. As well as the dynamometer, the CISPR 16, 10m chamber already boasts a catalogue of features, including a weight limit of up to 18 tonnes, forced air cooling, exhaust extraction, and a turntable capable of supporting vehicles up to 5 tonnes in weight and up to a 3.75m wheelbase. One of the four wheels can be used as a reference to keep all the others running at the same speed. Thus fulfilling the requirements of UNECE Regulation 10 or manufacturers OEM standards. Essential safety features are also in place. 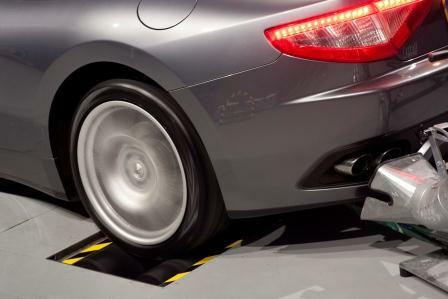 There are fibre optic and pneumatic switch options for emergency cut-off as well as multiple anchorage points and wheel guards to keep testing safe for everyone involved. The dynamometer system was built to exacting specifications. It needed to be a four wheel system capable of controlling all four roller speeds independently whilst measuring brake system pressures at each wheel and data-logging all process variables at 20ms intervals. The expertise of a range of companies was utilised to create a bespoke solution that matched the exacting needs of 3C Test’s customers. Axis Controls designed & built a floor standing control panel using Allen-Bradley control gear and a Pilz safety relay. Axis Controls also supplied the four pressure transducers used to measure the braking system at each wheel, along with eight encoders: four mounted at the non-drive end of each motor; four mounted at each roller. The encoders are all from the Sick DFS60 programmable range, as are the PBS pressure switches with digital PSI displays. The control solution was designed from Omron Electronics’ range of PLC, HMI and inverter drives, and an Omron CJ1 PLC was used as the main processor. The PLC rack is made up of a 4-channel analogue input card for measuring brake pressures, a 4-channel analogue output card for controlling inverter speeds, two 2-channel encoder feedback cards for measuring roller speeds, and an SPU data-logging module to record process variables. An Omron 15" colour TFT touchscreen was installed in the main operator control room. The whole system utilises Ethernet communications technology to allow Microsoft Excel spreadsheet analysis of the recorded data.